On January 6, 2012, it was 60 years since Amos Oz’s mother took her life. The memoir A Tale of Love and Darkness, written in 2002, was a tribute to her memory as well as the act of Oz’s reconciliation with his own memories. It took him half a century to gather enough strength to perceive and articulate what had happened that day; and it turned out to be a long story beginning in Eastern Europe centuries before. 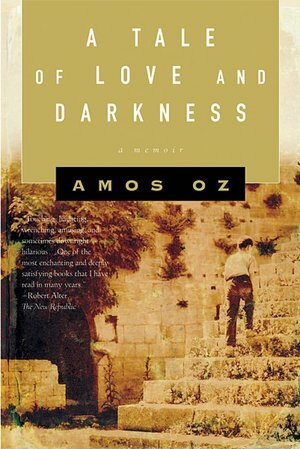 In my ignorance I had never heard of Amos Oz, a distinguished Israeli fiction writer, before I watched his conversation with Charlie Rose. This brilliant conversation is worth a separate review. I was so impressed by the writer’s personality that I immediately wrote his name in the top line of my reading list. I decided to begin with his memoir for several reasons: he is a descendant of Jews who immigrated to the Promised Land from Eastern Europe; he had never dropped a single word about his mother’s tragic death before writing the memoir; he mentioned in the interview that his memoir had not caught much attention in the U.S. So there it was, a 560-page volume lying in front of me. The English translation by Nicholas de Lange is marvelous. I believe it gives the true impression of the original. Long, flowing paragraphs are followed by ragged sentences; you can hear the strong Russian accent of Oz’s father whichever language he speaks; you can feel the throbbing development of Hebrew language. I was struck by the thought that the book may sound sharply out of tune for American ears; that a story of some Inuit village may appear more customary. For me, the book was surprisingly soothing like a tender touch of a close relative’s hand. Oz’s note about evolving Hebrew correlated with my non-native speaker’s feeling about living in a foreign country: “Perhaps that is how a short-sighted driver feels, trying to find his way at night through a warren of side streets in an unfamiliar car.” I wonder if Amos Oz would be pleased to hear that a Russian immigrant to America indulged her nostalgia in reading his memoir. I said a little compassion and generosity, but I didn’t say love: I’m not such a believer in universal love. Love of everybody for everybody—we should maybe leave that to Jesus. Love is another thing altogether. It is nothing whatever like generosity and nothing whatever like compassion. On the contrary. Love is a curious mixture of opposites, a blend of extreme selfishness and total devotion. A paradox! Besides which, love, everybody is always talking about love, love, but love isn’t something you choose, you catch it like a disease, you get trapped in it, like a disaster. So what is it that we do choose? What do human beings have to choose between every minute of the day? Generosity or meanness. Every little child knows that, and yet wickedness still doesn’t come to an end. How can you explain that? It seems we got it all from the apple that we ate back then: we ate a poisoned apple. In the memoir, the story of the nation, country, language, and family interweaves with the personal story. The structure is subtle. The author goes back and forth, travels in time and space, returns to seminal moments again and again. He draws unforgettable scenes, so vivid that a slight hint immediately revives them later. He repeats the long lists of streets and names. Those names are so unusual you don’t even try to pronounce them; and eventually they make up a visual, almost topographic image, so you can follow the writer in his memory tour, not looking at the signs but just relying on the images deeply imprinted in his heart. The narrative does not go smoothly. Sometimes the cart of memory becomes overloaded with personages and details and gets stuck on sharp turns. I may also have heard this from Zelda, my teacher, that summer when we were close: if you want to draw a tree, just draw a few leaves. You don’t need to draw all of them. If you draw a man, you don’t have to draw every hair. But in this she was inconsistent: one time she would say that at such and such a place I had written a bit too much, while another time she would say that actually I should have written a little more. But how do you tell? I am still looking for an answer to this day. It’s like a woman you’ve known for a long time, you no longer find her attractive or unattractive, whenever you bump into each other, she always says more or less the same few worn-out words, always offers you a smile, always taps you on the chest in a familiar way, only now, only this time, she doesn’t, she suddenly reaches out and grabs your shirt, not casually but with her all, her claws, lustfully, desperately, eyes tight shut, her face twisted as though in pain, determined to have her way, determined not to let go, she doesn’t care anymore about you, about what you are feeling, whether or not you want to, what does she care, now she’s got to, she can’t help herself, she reaches out now and strikes you like a harpoon and starts pulling and tearing you, but actually she’s not the one who’s pulling, she just digs her claws in and you’re the one who’s pulling and writing, pulling and writing, like a dolphin with the barb of the harpoon caught in his flesh, and he pulls as hard as he can, pulls the harpoon and the line attached to it and the harpoon gun that’s attached to the line and the hunters’ boat that the harpoon gun is fixed in the sea, pulls and dives down to dark depths, pulls and writes and pulls more; if he pulls one more time with all his desperate strength, he may manage to free himself from the thing that is stuck in his flesh, the thing that is biting and digging into you and not letting go, you pull and you pull and it just bites into your flesh, the more you pull, the deeper it digs in, and you can never inflict a pain in return for this loss that is digging deeper and deeper, wounding you more and more because it is the catcher and you are the prey, it is the hunter and you are the harpooned dolphin, it gives and you have taken, it is that evening in Jerusalem and you are in this evening in Arad, it is your dead parents, and you just pull and go on writing. While I was reading the memoir, a rather bizarre recipe came to my mind: mix healthy European pragmatism with Jewish sentimental romanticism, add a generous portion of alcohol and you will get what is called a mysterious Russian soul; stir the mixture vigorously, skim the cream off, and you will get a fertile substance to germinate an American. It is just a joke, no offense, as Amos Oz’s father used to say. About three years ago I read one critically acclaimed contemporary Russian novel. I was shocked by how gloomy and pretentious it was, so I have focused solely on American literature since then and have been enjoying my greater journey. A Tale of Love and Darkness made me turn to Russian literature again. Oz’s prose is often called “Chekhovian.” It was Chekhov’s prose, the only one of all Russian classics, which I tried to avoid in high school and never returned to later. Probably, it’s time to reread Chekhov now. Olga Khotiashova reviews memoirs periodically for Narrative. I hope you’re not speaking of The Master and Margarita! Well, though I was originally lured in by your description of the book, the sample passages don’t inspire me to read it. Maybe if I’d seen the Charlie Rose piece. I always love your reviews and insights. They’re so tender. Richard, thanks for this entry. Amos Oz was one of my favorite authors until 2000, at least. I believe I read everything by him that had been translated into English up until that time, but haven’t seen anything since. I will get this book and check out the Charlie Rose piece. Thanks, Dave. I am grateful to Olga for her review and, I guess, for adding another book to my growing TBR mountain . . . The reviewer says that “Oz’s prose is often called “Chekhovian.” Comparing Oz’s tsunami of adjectives and wild expressions of emotion was so contrary to what I recall about Chekhov’s writing I went back and re-read “A Lady With a Dog,” and “Happy Man.” From what I can see, Chekhov’s style is more directly narrative, telling a story sparely and directly, with important details embedded for the reader to find. I haven’t read anything by Oz, but based upon the fragments provided in the review, he is no Chekhov. I haven’t read anything else by Amos Oz either. I suppose, “Chekhovian” refers to his fiction. I’m tempted to figure it out.